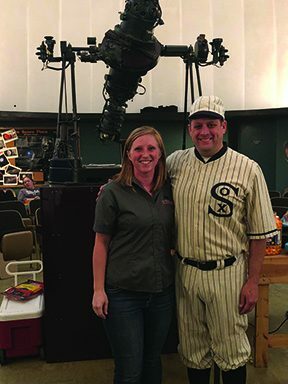 On April 5, the Heitkamp Planetarium welcomed not only the Dubuque County Farm Bureau but also a ghost to campus for a showing of “Field of Dreams” and some highlights of local farmers. Photo by Natalie Droeske — John Sutter, director of communications and marketing, dons his “Field of Dreams” uniform while taking a photo wth Brittany Menke, of the Dubuque County Farm Bureau, as they celebrate a partnership in support of the Loras College Planetarium. Five honors students along with the staff of the planetarium are working to replace the failing projector in the facility. As this project has been ongoing throughout the year, word reached Brittany Menke, the Bureau’s community outreach chair, and she reached out to the planetarium director in hope of procuring a partnership. The Dubuque County Farm Bureau is celebrating its 100th anniversary this year. It has a colorful history of community connections. As a local grassroots organization, they do more than serve farmers; they are active supporters of education, health care programs and rural business initiatives. Furthermore, they are dedicated to their mission of creating a vibrant future for agriculture, farm families, and their communities. The April 5 event was only one example of such community support. As students and members of the community began to arrive, they were greeted by a ghost from the “Field of Dreams,” Loras Director of Communications and Marketing John Sutter. Sutter spends many summer nights in Dyersville as one of the ghost players that emerge from the corn, and volunteered his costumed self for the Bureau’s event. “I’d be happy to put on my old-timey White Sox uniform and come to the event,” Sutter said when the idea was initially proposed. He says “Field of Dreams” is his favorite movie. Fitting with the theme, the Bureau provided cheese and beef jerky snacks to eat during the show. Once settled, following a brief presentation from Menke about the roles the Bureau plays in the community and beyond, the attendees were shown two videos from the Bureau as “previews” that featured local Dubuque farmers. The showing of Field of Dreams then had a realistic night sky background from the planetarium’s star projector, making for a full viewing experience. The proceeds donated on behalf of the Dubuque County Farm Bureau will benefit the project to replace the building’s projector. The planetarium staff was proud to give the Bureau’s centennial videos some exposure. Community partnerships like this lie at the heart of the planetarium’s projector replacement project. “Every night we host continues to be enjoyable for everyone involved, and brings us closer to our ultimate goal: procuring a new and functional projector that we can share with Loras and the greater Dubuque community,” said Kuckenbecker. Natalie Droeske is the Executive Sports Editor for The Lorian.